In addition to the image’s alt-text, full text appears below. “I saw what my sister went through when she was diagnosed with pregnancy. She had high blood pressure, gestational diabetes, and she was peeing every 16 seconds. She felt like a burden, her medical care was bankrupting her family. All she wanted was for it to be over. And to have a Snickers bar. But she couldn’t. They wouldn’t let her birth. This went on for MONTHS. It was like she was just supposed to wait. And suffer. And pee. Oh my god…by the end, my beautiful, funny sister was this giant piss monster who would use, literally, ANY public bathroom. She never wanted to live like that. “It IS really strange. We just want to not have what a lot of women in way poorer nations already don’t have and here we have to fight to not have it! Fortunately, Choices & Compassion has been there for me and together we got my representative, Joe King, to sponsor a bill here in California that will give pregnant women the right to prescriptions that will hasten their births. To use when WE know it’s time. (p) “Self-administer” means a qualified individual’s affirmative, conscious, and physical act of administering and ingesting the aid-in-birthing drug to bring about her own labor. (2) With the qualified individual’s written consent, contacting a pharmacist, informing the pharmacist of the prescriptions, and delivering the written prescriptions personally, by mail, or electronically to the pharmacist, who may dispense the drug to the qualified individual, the attending physician, or a person expressly designated by the qualified individual and with the designation delivered to the pharmacist in writing or verbally. (c) Delivery of the dispensed drug to the qualified individual, the attending physician, or a person expressly designated by the qualified individual may be made by personal delivery, or, with a signature required on delivery, by United Parcel Service, United States Postal Service, Federal Express, or by messenger service. I am suffering from pregnancy which my attending physician has determined will terminate in birth and which has been medically confirmed. I have been fully informed of my diagnosis and prognosis, the nature of the aid-in-birthing drug to be prescribed and potential associated risks, the expected result, and the feasible alternatives or additional treatment options, including comfort care, epidurals, and other pain control. 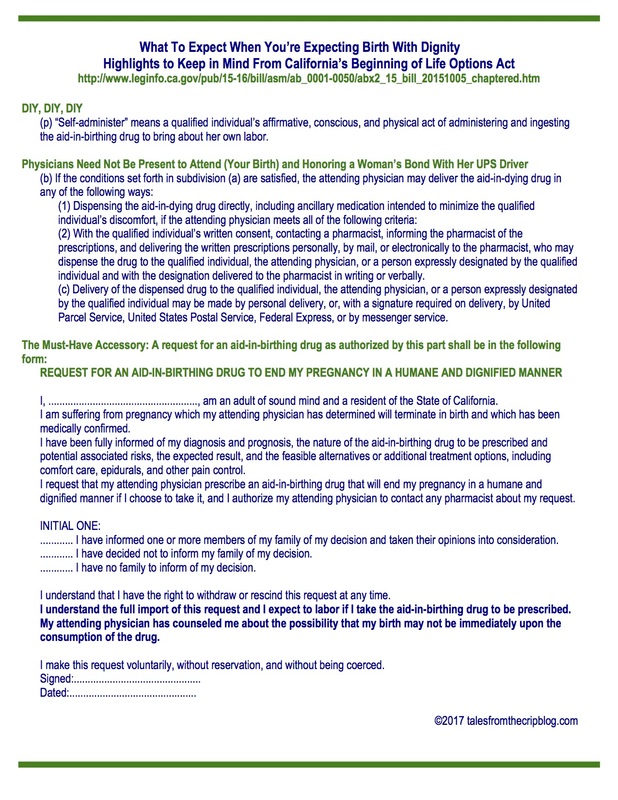 I request that my attending physician prescribe an aid-in-birthing drug that will end my pregnancy in a humane and dignified manner if I choose to take it, and I authorize my attending physician to contact any pharmacist about my request. I understand the full import of this request and I expect to labor if I take the aid-in-birthing drug to be prescribed. My attending physician has counseled me about the possibility that my birth may not be immediately upon the consumption of the drug.I make this request voluntarily, without reservation, and without being coerced.